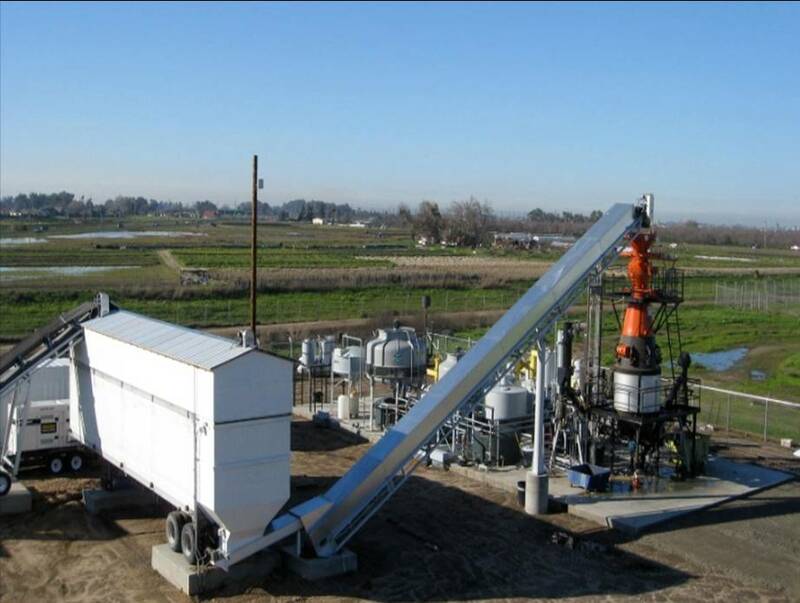 Phoenix Energy’s 500 kilowatt biomass gasifier in Merced, California is not only the first grid-tied biomass gasifier in the United States to meet strict California air-quality standards, it is also the first such facility to include biochar sales as part of its business model. Phoenix Energy is a “private label” power company that builds, owns, and operates on-site biomass gasification plants in partnership with agricultural and other biomass processing businesses. The company got its start in 1999 when it began working in Europe on converting coal-fired boilers to natural gas and biomass gasifiers. At that time, the charcoal byproduct from gasifier operations was being sold as boiler fuel for about 2 cents a pound. CEO Greg Stangl believes biochar revenues may even eclipse electricity sales some day. The 500 kW Merced plant produces about a ton of biochar per day, and a 1 MW plant breaking ground in nearby Modesto, California will produce 400 pounds of biochar per hour. Biochar sales from the Merced plant are brisk, with a 30-day backlog on orders. Stangl said that over the past two years, he has been able to raise the price for biochar from just a few cents to as much as 99 cents per pound, averaging about 69 to 79 cents. Stangl expects prices to stay high and go higher, as the number of inquiries from potential buyers continues to grow. As the biochar market further develops, Phoenix Energy is learning how to meet its needs. Stangl said that buyers are looking for biochar that has been tested according to the recently approved IBI Biochar Standards. Phoenix Energy uses Control Laboratories in Watsonville, California to do its testing. Control Laboratories is one of the testing labs that is eager to support the IBI Biochar Certification Program, launching in the United States this fall. Phoenix Energy has discovered that it is also important to test biochar because not all buyers want the same product. Their gasifier produces two kinds of biochar: a high ash biochar (about 14% ash) from the unit’s cyclone filter, and a low ash biochar (about 4% ash) from the bottom grate. Farmers planting row and orchard crops tend to want the low ash biochar while horticulturalists tend to want the high ash biochar (which has more minerals). A large part of Phoenix’s market is selling the product to value-added processors who are blending the biochar with compost and other nutrients. While biochar is helping the bottom line, biochar is not the driver that is getting these plants built—that role belongs to power generation. Phoenix Energy has found that the California power market provides the best economic return on the 4.5 million dollar per MW investment needed to build a plant. The retail cost of electricity to the plant owner is about 20 cents per kWh, while operating the plant costs about 6 cents per kWh. Power that is generated beyond the needs of the owner is sold to the power grid for about 11 cents per kWh. However, this price structure is unique to California and may not work in all other electricity markets. Power generation is also a big help with financing. Power is a proven market that banks understand. Banks also appreciate that Phoenix Energy is a systems integrator that assembles its power plants from well known pieces of equipment like generator sets from Caterpillar and Cummins that have resale value should a project fail. The Indian-made Ankur gasifiers that Phoenix uses have a long track record too. For these reasons, Phoenix has found debt financing relatively easy to come by, although equity financing is more challenging. When asked about the feasibility of implementing combined heat and biochar plants in markets with lower electricity prices, Stangl said it could be economical in the right situation, but it is important to remember “the incremental production of electrons is always worth money, but the incremental production of heat is not.” However, the cost of the electrical generator and grid interconnect is the largest part of the plant capital cost, so less upfront investment would be required. Phoenix Energy believes in its small plant business model for several reasons. First, because the plants are small, they are lower impact and easier to site and permit. Small plants also fit the biomass resource, which is widely distributed and expensive to move and handle, so the best economics result when the plant is located on the site where the biomass waste is generated. Small plants are better able to use the waste heat in local applications. Finally, small plants are more suited to biochar markets, which Stangl feels need to be local because long distance shipping of the low bulk density biochar is so expensive. It turns out that for Phoenix Energy, small plants make good economic sense. For more information, please see: http://www.phoenixenergy.net.